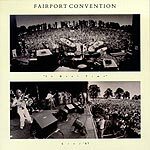 CD review: "In Real Time - Live '87"
While folk purists insist that Fairport Convention ceased to exist with the departure of Sandy Denny and Richard Thompson in the early 1970s, the band has endured and continues to produce outstanding music. It's hard, in fact, to think of a band that has done more to popularize the folk music of the British Isles. "In Real Time" was recorded in August 1987 in Cropredy, Oxfordshire at Fairport Convention's annual folk festival. Violinist Ric Sanders is now a full member of the band, and his fiddle is prominent in their sound. His rich tone adds as much to that sound as Simon Nicol's rough vocals. Drummer Dave Mattacks and bassist Dave Pegg keep the traditional rhythms, while Martin Allcock's guitar passages weave beautiful melodies based on traditional lines. The combination is a peasant stew that makes British tradition accessible to modern audiences.